Enjoy a rejuvenating soak in the tub while surrounded with the sweet and fruity smelling bubbles of our Fruit Punch Foaming Bath Salts. 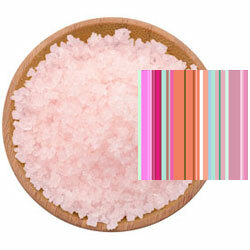 Foaming Pacific Sea Salts in a fine/medium grain blend with a sweet fruit punch scent. Light pink in color. Benefits: A rejuvenating foaming bath salt. Ingredients: Pacific Sea Salt, Sodium Lauryl Sulfoacetate (Lathanol) Powder, Fragrance, Glycerin (Vegetable Glycerin), Tocopherol (Vitamin E), Aloe Barbadensis (Aloe Vera) Leaf Juice, D&C Red 30.